By a resounding vote of 28 to 2, the Vermont Senate on Thursday moved to enshrine abortion rights in the state Constitution. The vote sets off a multiyear process that could culminate in a statewide referendum in the 2022 election. The one-sentence constitutional amendment, known as Proposition 5, would guarantee that "an individual's right to personal reproductive autonomy ... shall not be denied or infringed unless justified by a compelling State interest achieved by the least restrictive means." Supporters of the measure argued Thursday that while abortion remains legal in Vermont and throughout the country, that may not always be the case. 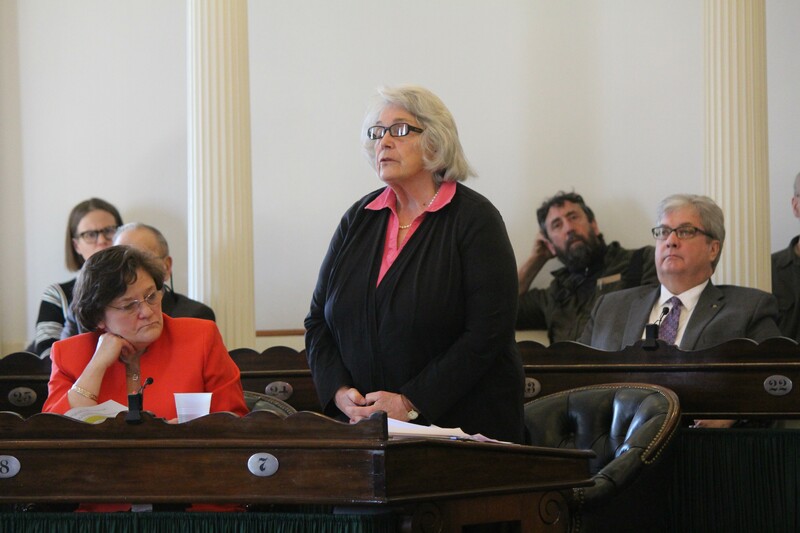 "For nearly 50 years, Vermonters have relied on the protections offered by Supreme Court case law to support how we value personal autonomy and reproductive health decisions," Sen. Ginny Lyons (D-Chittenden) told her colleagues on the Senate floor. But those protections could be overturned by "a very conservative U.S. Supreme Court," she said. "It's time to put the question to the voters in this state." In the Senate, at least, there was little dissent. No members spoke out against the measure on the floor, and only Sen. Brian Collamore (R-Rutland) and Sen. James McNeil (R-Rutland) voted against it. In an interview after the Senate adjourned, McNeil said his vote was guided by his Roman Catholic faith and his opposition to most instances of abortion. "I do believe in women's rights, but I also believe in the rights of a fetus — an unborn child," he said. "Somebody has to speak up for folks that can't speak, or are never allowed to speak." Abortion wasn't the only hot-button topic up for debate Thursday. Sen. John Rodgers (D-Essex/Orleans), an avowed supporter of gun rights, used the occasion to question the legislature's recent embrace of gun-control laws, which he characterized as unconstitutional. "I'm struggling some with this — adding something to the Constitution — when, in my view, this very Senate has done things to take constitutional rights from me that I both value and exercise," Rodgers said. He later made clear that he would nevertheless support the abortion-rights amendment, saying that he had always supported a woman's right to choose. Much of Thursday's hourlong debate was dominated by men, a point that Sen. Becca Balint (D-Windham) drove home as the vote approached. "I rise on behalf of the women of this chamber, who are sitting very patiently, listening to an amendment that speaks directly to our lives," she said. "It's very difficult to not hear other voices of women brought into the chamber." Unlike most legislation, which requires only a majority vote, constitutional amendments must pass the Senate by a two-thirds margin. Proposition 5 moves next to the Vermont House, where it needs only a simple majority. House Speaker Mitzi Johnson (D-South Hero) said earlier Thursday that as soon as the amendment passed the Senate, the House would schedule a public hearing. "The constitutional amendment for access to reproductive health is the long-term, stable goal of giving Vermonters what they've had for 46 years," the speaker said. Following House passage, the measure would face another pair of votes in the legislature during the 2021-2022 biennium and then a public referendum in November 2022. In the meantime, many legislators hope to protect abortion rights by passing a state law that would accomplish the same goal. A bill to do that, H.57, passed the House by a 106-37 vote earlier this year. Senate leaders pledged Thursday to take up that legislation soon.